Research shows high-quality employment support programs, like ILE, which focus on teaching essential vocational soft skills, lead to higher rates of employment for adults with Autism. This new partnership allows our team to provide high-quality employment services to more families by easing the cost burden associated with disability services. The job placement process can be overwhelming and frustrating for anyone; however, the specific social and cognitive deficits related to Autism can make the process discouraging for both the individual and their families. Questioning where to turn, while struggling with what the next step should be can inhibit families from identifying the right supports. Our research-based services allow for both short and long-term employment supports tailored around each client’s goals, interests and needs. At ILE, we approach employment support as several distinct phases including: pre-employment skill development, job placement, supported employment, job coaching, and, most importantly, vocational soft skills. We have a unique opportunity as an organization to serve a wider population of adults with disabilities in need of receiving supported employment services. This partnership will allow us to accomplish what we do best: focus on each client as an individual and deliver responsive and high-quality services. Our goal is for individuals to reach their highest potential through staff support and services based solely on their specific needs, interests and goals. The ILE staff is a highly qualified group of professionals with advanced degrees and experience working alongside individuals with disabilities. 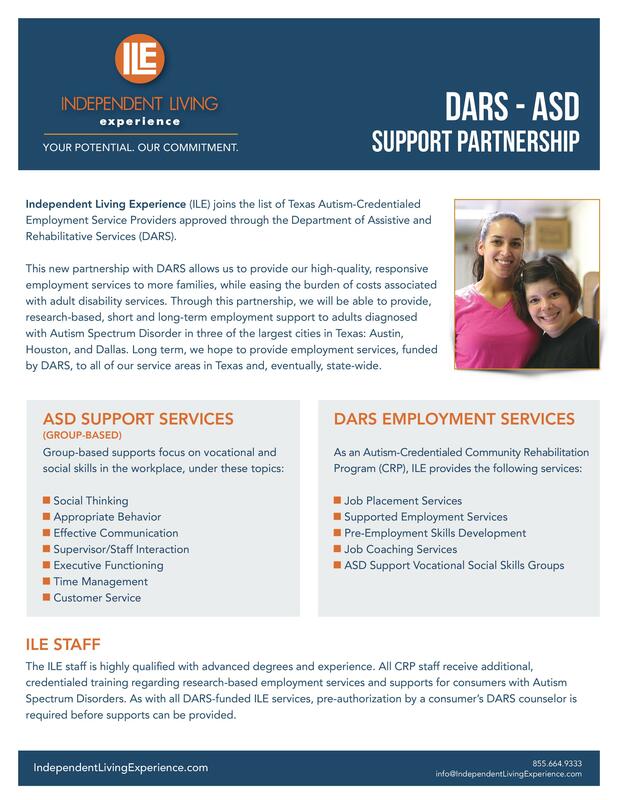 As an Autism Credentialed Community Rehabilitation Program through DARS, the ILE staff will receive specialized training in research-based employment services and providing supports to consumers with Autism Spectrum Disorders. Together, the ILE team works collaboratively, with each client and their family, to determine personal and professional goals, individual needs, and the desired direction for their future.